We have an affection for fine bookends at Booktryst. A colleague is now offering four outstanding and collectible examples we thought we'd share with you. Nudes on Books. [American]: Nuart Creations, [ca. 1929]. (8.5 x 4.25 x 2.5 inches). Just over 5 pounds the pair. Pot metal with a warm bronze finish. Both stamped "© Nuart N.Y.C. ", and retain most of the original felt bottoms. A couple tiny spots of loss to finish, small dings to both girls' noses, but still an exquisite set. Yes, we prefer our ladies with a warm bronze finish with their original felt bottoms, a few dings on the nose an ethnic plus. It demonstrates character; these beauts have been around, and are proud of the face they've earned, screw cosmetic surgery. 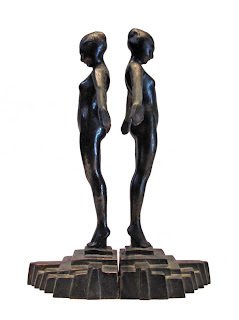 Nuart Creations was known for its attractive and inventive Art Deco female figures, of which this rare pair is a prime example. 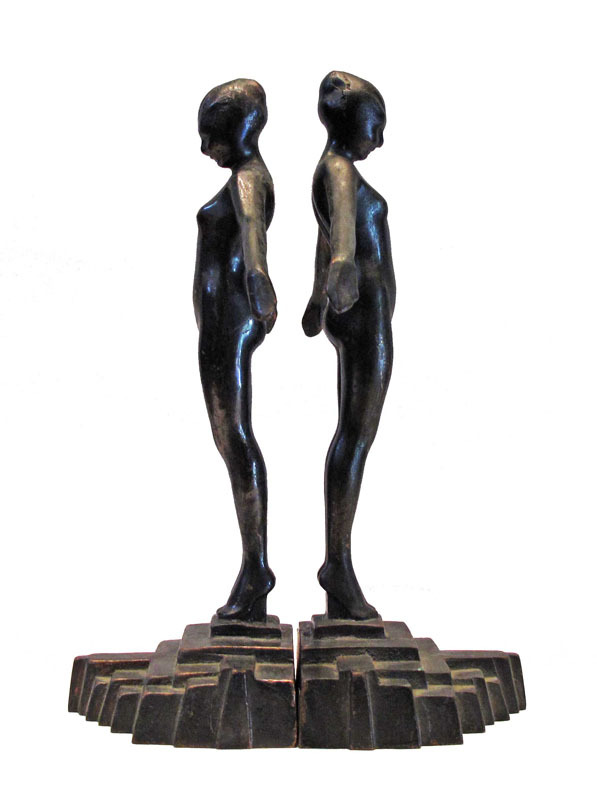 Variant of Kuritzky, Collector's Encyclopedia of Bookends. Identification & Values 1182. Perfect Symmetry. [American: Glauber, ca. 1925]. (9 x 5.5 x 3.25 inches). Almost 9 pounds the pair. Solid bronze. 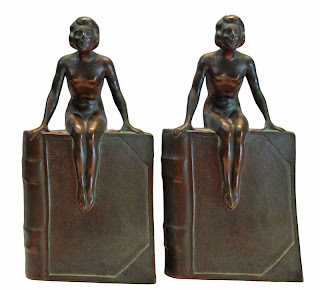 Variant of Kuritzky, Collector's Encyclopedia of Bookends. Identification & Values 1208. I know that many Booktryst readers are dog lovers. Below, a pair of gorgeous greyhounds, albeit gold. (7.25 x 3.5 x 5 inches). 8 pounds the pair. Cast of gold finished gray metal, set on marble bases. 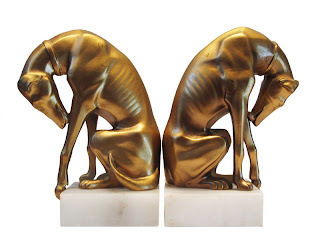 There's an Art Deco-Egyptian deity quality to these bookends that is particularly attractive; a handsome pair. Variant of Kuritzky, Collector's Encyclopedia of Bookends. Identification & Values 424. We move from the cool and remote idols above, to the nearly-too-cute-for-words-I-may-go-into-diabetic-shock-yet-gosh-darned-adorable dogs below. 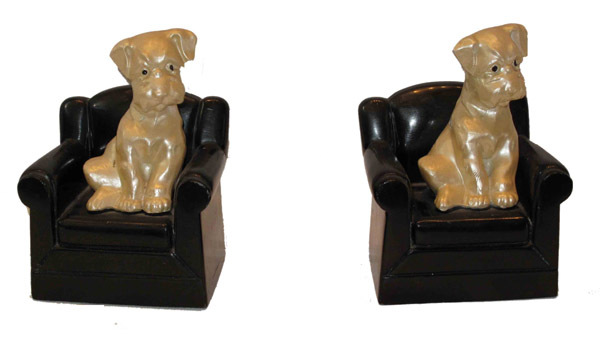 Dogs on Black Leather Chairs. New York: Nuart Creations, [ca. 1935]. (158 x 145 mm.) Four and a half pounds the pair. 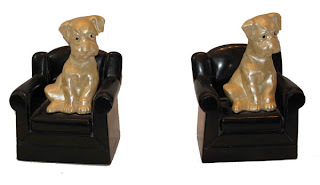 Cream-colored metal dogs on black painted chairs, also metal. One with its original felt bottom, the other lacking, aw shucks, both stamped "© Nuart Creations N.Y.C. Made in USA." Kuritzky, Collector's Encyclopedia of Bookends. Identification & Values 1230. I'm just thankful that the dogs are on black leather and not in it, with collar, muzzle, and chain leash: An ASPCA Vice-Squad nightmare! Images courtesy of Dragon Books, which is currently offering these bookends, with our thanks (for the pix).